After riding the classic bikes of the French constructeurs, we began to wonder why they handled so well. The result was a major study of front-end geometry. To publish our findings, we had to add eight pages to this issue. For the first time, we discuss how front-end geometry needs to account for speed, tire size, load placement and riding position. We explain why low-trail bikes are so stable under tired riders, and why more trail doesn’t make a bike more stable. The revolution started here! We also look at touring bikes and their riders. Greg Siple’s portraits of riders who passed through the Adventure Cycling headquarters show a great variety of riders. We test a CoMotion Nor’Wester with S&S couplers, as well as one of the fabled 1970s René Herse Démontable take-apart bikes. And the irrepressible Docteur Ruffier takes us on a bicycle trip in 1889, when travel still was a true adventure. 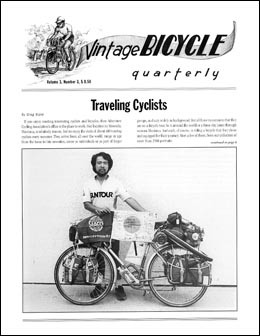 8 What Makes a Good Touring Bike - Mike Barry's Herse "Camping"
12 Test: 1971 René Herse "Démontable"
22 Test: Co-Motion "Nor'Wester Co-Pilot"